Maybe you’re participating in a company golf tournament, taking part in community service through your local club or organization, or just want to look great and represent your business in a professional way. Wearing a custom polo shirt on any of these occasions is one of the best ways to look great and let people know who you are. Custom printed polo shirts are a superior way to advertise your business, and Seaboard Graphics can help you create a shirt that not only looks great, but is also a marketing tool. You can personalize top-name men and women’s golf shirts, in a broad range of colors – with your company name and logo – quickly and easily. Our talented team of graphic designers will help you create just the right image for your shirt, or provide us with your own design. 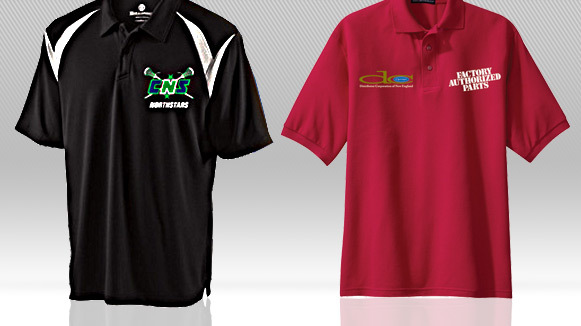 Custom polo and golf shirts from Seaboard Graphics work great as advertising specialties, and they’re also perfect for meetings and golf tournaments – virtually any outing where you’d like to show company unity and pride. Seaboard Graphics is ready to help you create a custom polo that promotes your business or organization in the best possible way. To find out more about our custom polo printing services, call us at 800-721-1663 or contact us, and we will be happy to help you.